At a meeting of Chapter on 6 December 2016, the Archbishop formally assented to the Cathedral Act 2016, the first new legislative instrument for the Cathedral in more than 138 years. The new Cathedral Act was brought in by October Synod of the Diocese of Melbourne, revoking the Victorian legislation that previously governed the Cathedral. The implementation of the Act creates a smaller governing body by removing regional ex officio representatives, such as Chapter Archdeacons. It also for the first time gives Cathedral members an opportunity for a direct election of representatives to Chapter. At their meeting, Chapter formally welcomed the three congregational representatives, Associate Professor Kate Drummond, Mr Rob Deutscher and Mr Neil Farbridge-Currie as Canons. At the same time, Chapter farewelled three members: Chapter Bishop Paul White, Chapter Archdeacon Neil Hicks and Chapter Clerk Prof. Peter Sherlock. 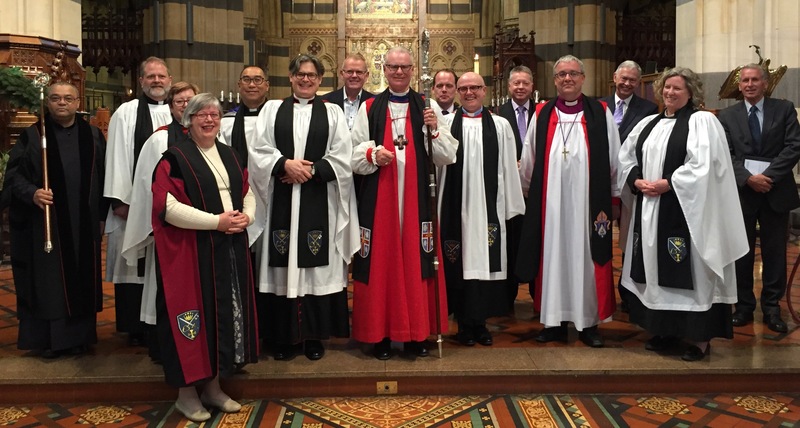 Dean of Melbourne, Dr Andreas Loewe said: ‘The new Cathedral Act has, for the first time in 138 years, done away with the distinctions between lay and ordained members of Chapter, and given a vote to members of our own congregations. Our congregational representatives serve Chapter through their expertise and insight, and I am delighted that they are now full Canons with a vote and voice, equal in membership to other Chapter members’. In thanking the three departing members, the Dean commented: ‘I thank the three departing members of Chapter for their service. Bishop Paul has provided important liturgical leadership in the Cathedral, especially at our regular Easter confirmations. Archdeacon Neil has placed his expertise in service of our Planning and Buildings Committee, and I am delighted that he has agreed to remain a member of that body. Canon Peter has served as the inaugural chair of our flourishing Culture and Heritage Committee, as a highly effective Chapter Clerk, and was one of the architects of the new Cathedral Act. I am delighted that he will continue serving the Cathedral as a trustee of our Music Foundation. I pay tribute to the significant service to St Paul’s of Bishop Paul, Archdeacon Neil and Canon Peter, thank them for their leadership, and for their continued association with our ministries’. At the meeting, Chapter also created two new senior clergy of the Cathedral, the Reverend Christopher Carolane and the Reverend Dr Jill Firth, as Cathedral Canons. Canon Christopher Carolane has served the Cathedral as an associate priest for almost twenty years, and is lead pastor of the Family-style Sunday Service. Canon Dr Jill Firth joined the Cathedral’s team in 2014, and also forms part of the leadership of the Family-style Service. The Dean said: ‘I congratulate Chris and Jill on their appointments as Cathedral Canons. Their appointment recognises their service to the Cathedral, and their commitment to see its ministries flourish in teaching, preaching and service’.